What happens when a “Change Agent” and Laboratory Medicine come together? 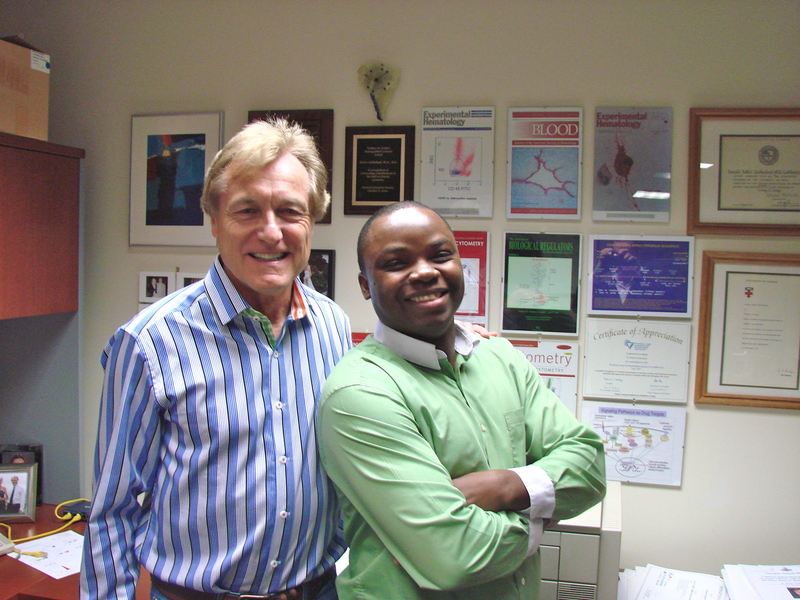 Recently, Kwabena Boateng spoke with Rob Sutherland, Technical Director of UHN Clinical Flow Cytometry, a member of LMP, who has about 30 years of experience studying the CD34 molecule. While only three per cent of bone marrow white blood cells have the CD34 molecule, these cells are responsible for helping the blood system in bone marrow transplant patients function normally after they have gone through cancer and chemotherapy. Rob’s studies of CD34 and the associated antibodies led to new methods of isolating these renewable stem cells. Based on his work, Rob developed a very accurate flow cytometric assay to count CD34+ cells in the bloog. Circulating ‘stem cells’ were taking over from bone marrow as a source of stem cells in the transplant setting and accurate counting of CD34+ cells was essential to ensure that patients received enough to be effective. When Rob’s method was published he was invited to write an International Guideline for assessing Blood Stem Cell grafts, but he immediately faced much criticism and hostility from some other researchers in the field and commercial enterprises whose own methods were shown to be sub-optimal. This was a tough period as Rob publicized his methods at international meetings and had to respond to many attacks on his science. He ran workshops, identified and educated key leaders in the field, established close collaborations with more open-minded colleagues and published a number of Consensus Guidelines Documents until these methods became accepted as the best available. “Change agents,” such as Rob Sutherland, can either be internal (managers/employees) or external (consultant from outside firm). The success of any change effort rests heavily on the working relationships between key decision makers and the change agent. As Rob says, “this is what good science is about but it is also about the quality of patient care;” erroneous laboratory results can have very serious negative impacts on patients in the bone marrow transplant setting. Rob’s work has helped transform what was once a risky treatment into one that is almost invariably safe and effective. As a change agent, when leading a change effort, one must be able to envision, plan, implement, review and learn. Through the process of exploratory inquiries (asking key questions), one will be able to move towards diagnostic inquiries (solutions). Change is good, but in an effort to implement great change, one needs to articulate a clear vision and form a strong coalition with like-minded colleagues to help communicate and execute the vision. Ask yourself: what are you doing to become a ‘change agent’ in your area of the laboratory?